The first known Nikon camera, Nikon Video Still Camera Model 1 which was designed for digital imaging (a floppy disk based, black-and-white-only digital imaging camera) was showcased at Photokina '86. The displayed unit adopted a new QV-mount (can be converted into Nikon F-lens bayonet via an adapter), and a Nikkor 6 mm f/1.6 lense (never specified whether it is a QV-mount Nikkor). However, this camera has never been officially went into commercial production and has just remained only as a prototype. 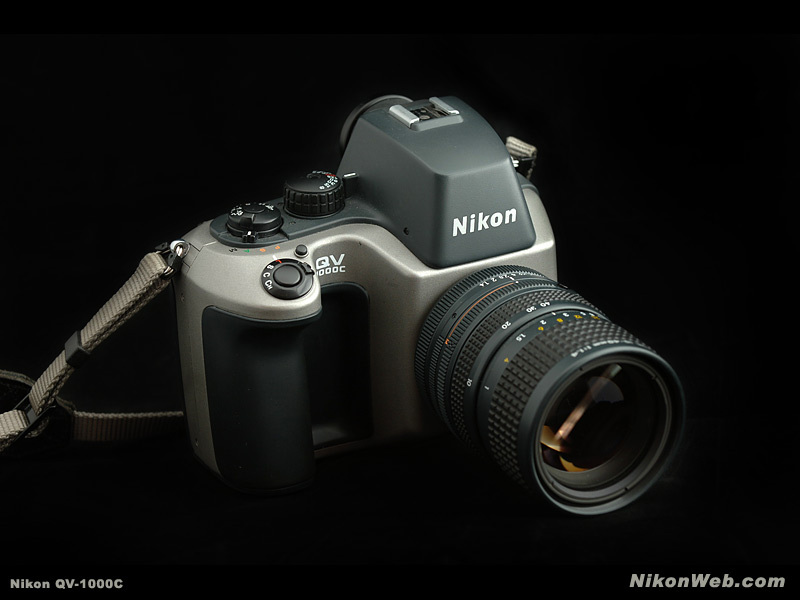 * The more known unit, Nikon QV-1000C Still Video Camera, which was more popularly referred as Nikon's first non-film-based SLR also uses similar concept of the previous mentioned Model 1, which uses a "digital" medium (via a 2 " micro-floppy magnetic disks that can store approx. 380,000 pixels images), can has the capacity to take approx. 50 images).Source: Nikon website. The QV-1000c, a strictly black & white format camera offers basic features like any of today;s digital-medium camera and even can handle tasks such as cropping or remit via telephone lines to designated receiving end. The camera also offers standard AE control modes (Programmed AE, Shutter Priority AE, Aperture Priority AE or Manual exposure control). TTL flash is also possible with this camera via its ISO-type accessory shoe that rests a top at the rather oversized pentaprism. The usable shutter speed range is from 1/8 sec to 1/2000 sec with ISO from 400 to 1600 and equipped with secondary features such as memory lock and exposure compensation dial switch is provided. The camera uses a few dedicated lenses but conventional 35mm SLR lenses can also be used via an adapter called QM-100. The two interesting aspect of the camera are: 1) its QV-mount bayonet which enables two dedicated QV-mount Zoom lenses to be used exclusively with the camera (F-mount lenses can be used via the adapter), 2) the top shooting speed is an astonishing 20 ips (images per second) when set at CH mode, the slower 4 fps is possible at C (continuous) or S (single) mode. The "standard" lense for the QV-1000 is a 15 elements, dual rings, fast speed 40-160mm 35mm equivalent QV Zoom-Nikkor 10-40mm f/1.4. The lense has a close-focus design to enable macro shooting at 8.7". Lens diameter is a moderate 62mm despite its fast aperture. The alternative option, QV Zoom-Nikkor 11-120mm f/2.0 ED was an ED-glass equipped, extremely complex optical design lense which uses a total of 21 lens elements in its optical construction. The lense has a standard to super-tele zoom range (44-480mm at 35mm equivalent). The closest focusing distance is 3.6' and a filter diameter of a huge 82mm thread size. presents you with a surprise, as recently he mailed me some fabulous images of this rare, highly collectible camera for this Nikon resources. Photo Credit: All images courtesy of Mr. Jarle Aasland ® ™ from NikonWeb.com. Images copyright © 2006. All rights reserved. Please respect the visual property of the contributing photographer. CONTACTING Jarle.